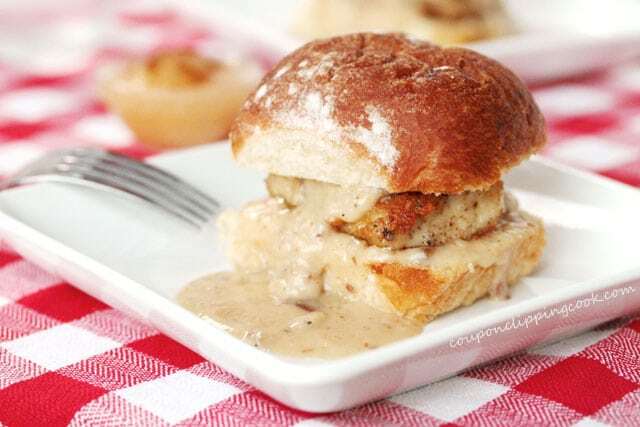 These fried chicken sliders are the best of both worlds…they’re a scrumptious finger food, and because they’re sliders, you get fried chicken, gravy and a soft roll in each and every bite. These can be served as an appetizer or a main dish. For even more comfort food goodness, they can be served with “Easy Potato Salad with Egg” or “Homestyle Elbow Macaroni Salad“. 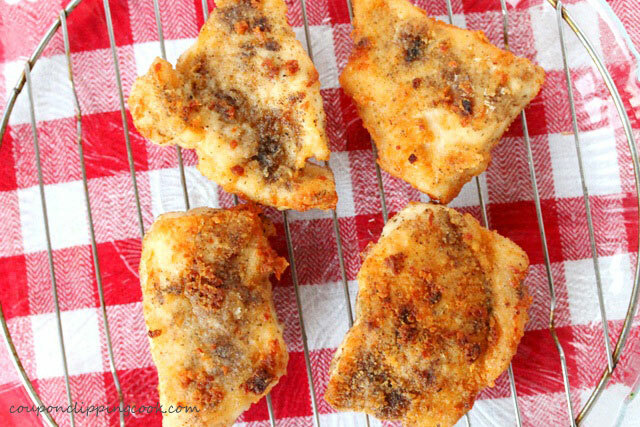 Fried chicken smells so good when it’s cooking. I remember my grandmother cooking fried chicken in an electric skillet and it was delicious hot or cold. All that my grandma used for coating the chicken was salt, pepper, and flour so that’s how I like to make it too. Here’s her recipe (minus the electric skillet) “Simple Fried Chicken“. 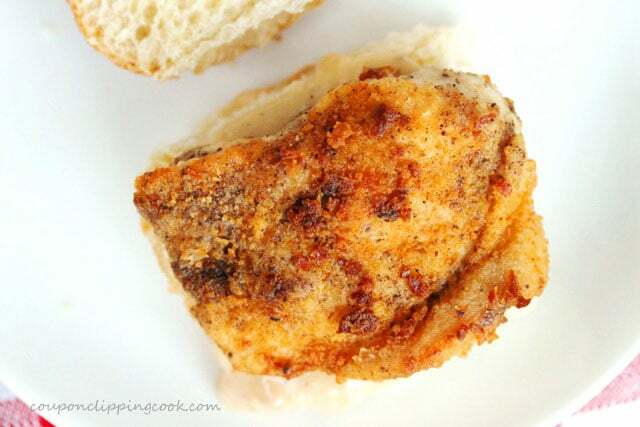 Here’s another comfort food recipe with the same chicken fried coating for thickly sliced pork loin. 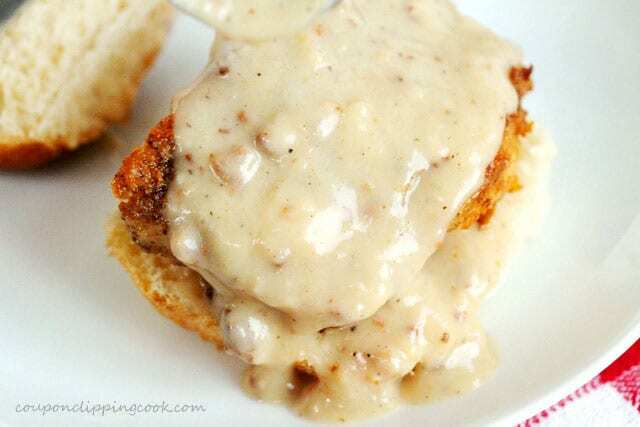 It’s really good too “Chicken Fried Pork Medallions with Gravy“. 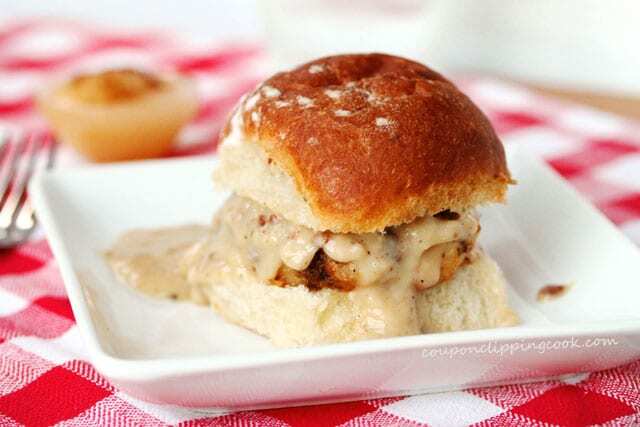 In this slider recipe, I did sneak some real bacon bits in the oil when frying the chicken but I’m sure my grandmother would approve. 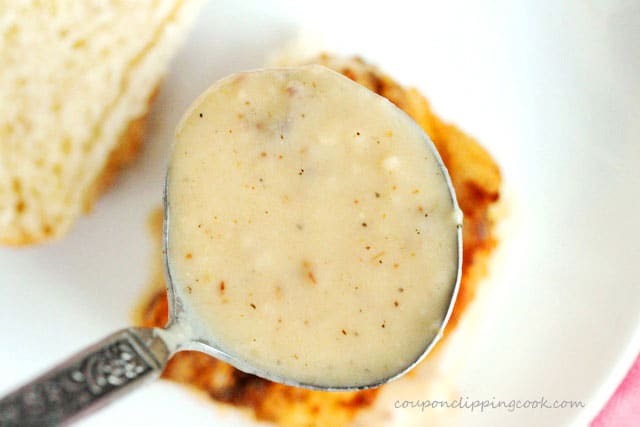 I just couldn’t let those bacon laden drippings go without making gravy out of it. 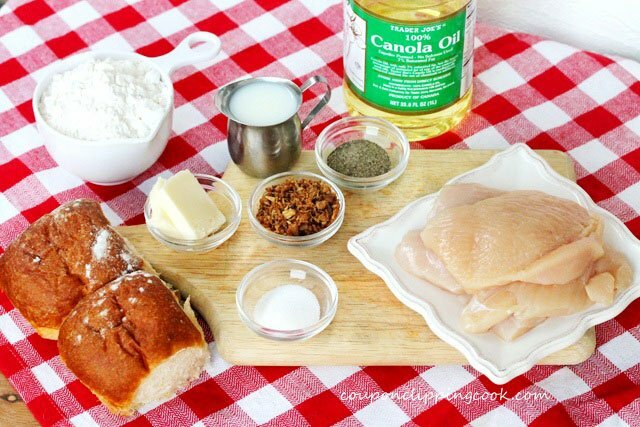 Preparing the Chicken – Cut the chicken breasts in half widthwise. Add salt and pepper to each side of the chicken and set aside for a moment. To a medium size shallow bowl or large plate, add the flour. Then dredge the pieces of chicken in the flour and generously coat both sides. Set the pieces of coated chicken on a plate and set aside for a moment. and spread them around in the skillet. carefully add the chicken to the skillet. 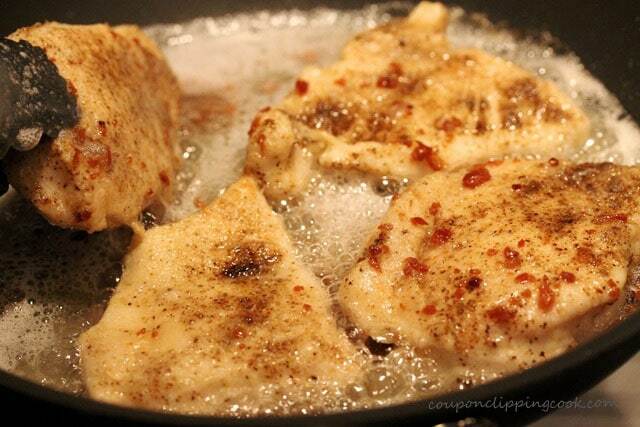 Depending on the size of skillet used, the chicken may need to be cooked in batches to avoid overcrowding in the pan. When the bottom side of the chicken turns a light golden color, turn the chicken over. Then after the other side of the chicken turns a light golden color, turn the chicken to the other side again. After that side turns a little bit darker, turn the chicken again…the idea is to keep turning the chicken so it doesn’t cook or brown too fast. 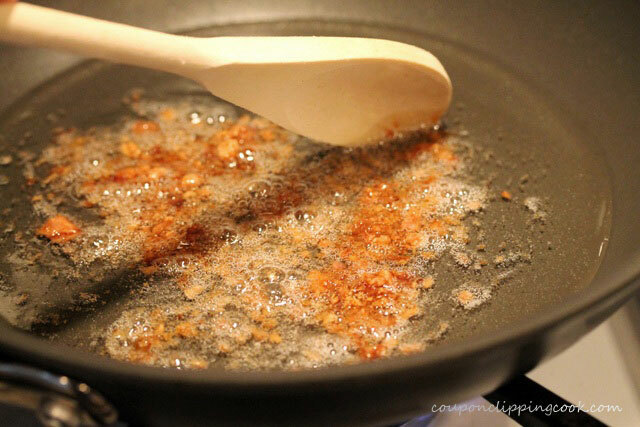 If the drippings in the pan are turning a darker brown color, turn the heat down a little. When all sides of the chicken are a light golden brown (about 7 minutes) and the chicken is thoroughly cooked, turn off the heat and transfer the chicken from the pan onto a rack or plate. 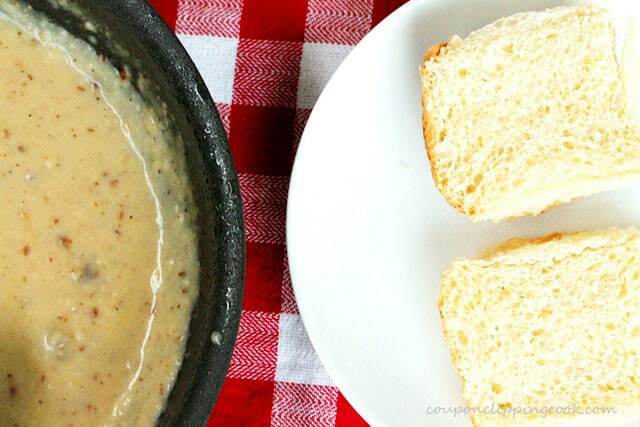 Set aside while making the gravy. 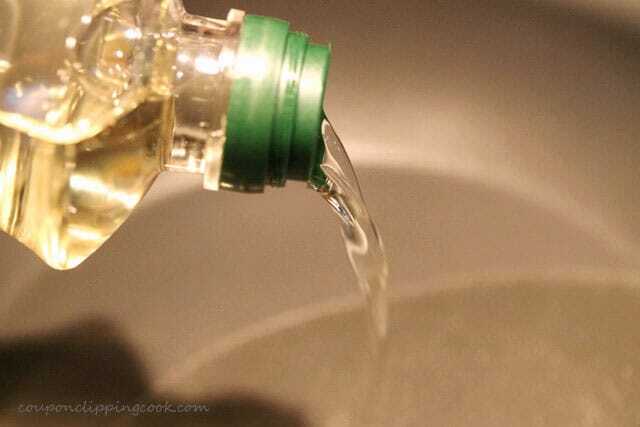 Carefully transfer just the oil from the skillet into a heat resistant mug or bowl, or empty can (after it cools completely, discard it). 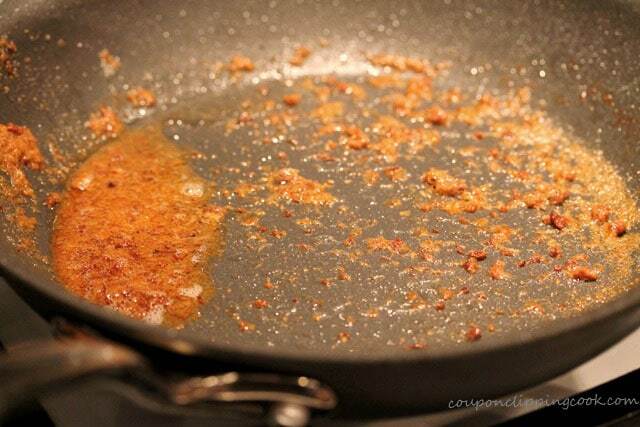 Keep as many of the crunchy bits and pieces of bacon in the pan as possible. 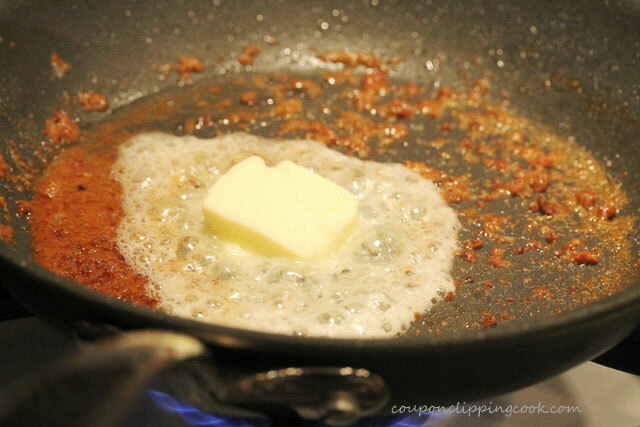 Heat the skillet with the drippings and bits on low to medium heat. Stir until the mixture thickens (about 2 minutes). 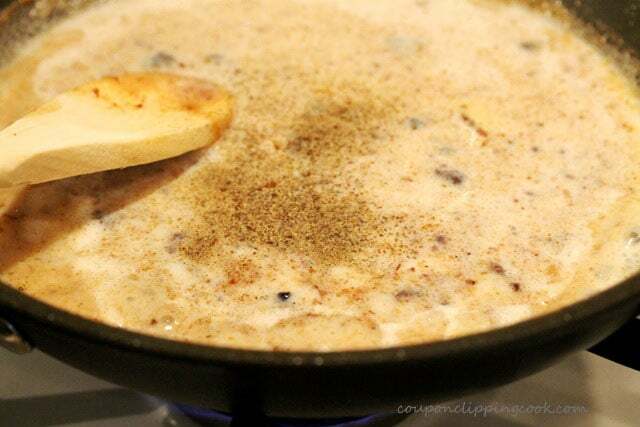 Continue stirring until the gravy is at the desired consistency (about 5 minutes). Lay the bottom side of each slider roll on the serving plates with the inside of the roll facing up. 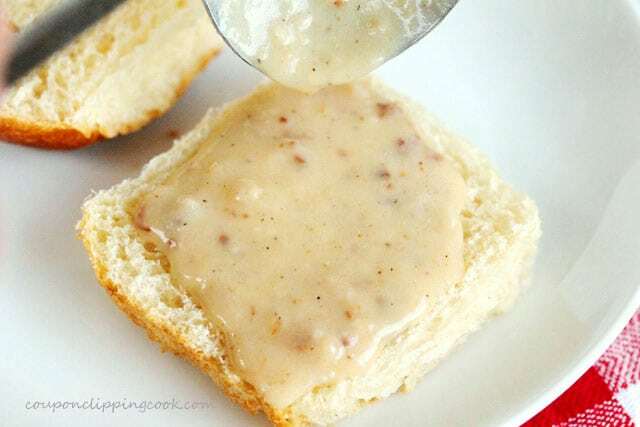 Ladle gravy over the rolls (just to the bottom sides). 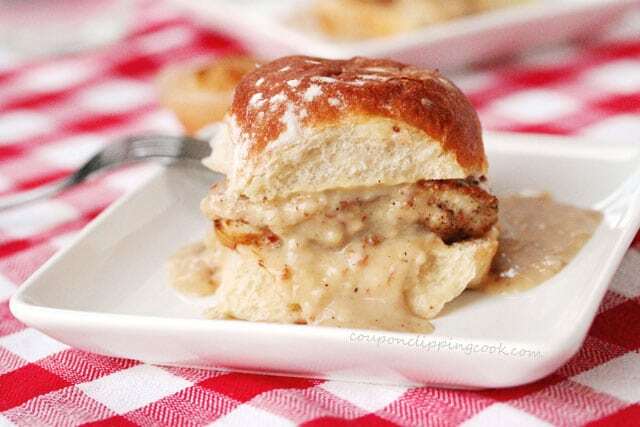 …and ladle more gravy over the fried chicken. …top with the remaining rolls (the top halves). Preparing the Chicken - To the halved chicken breasts, add salt and pepper to each side. Set aside for a moment. To a medium size shallow bowl or large plate, add flour. 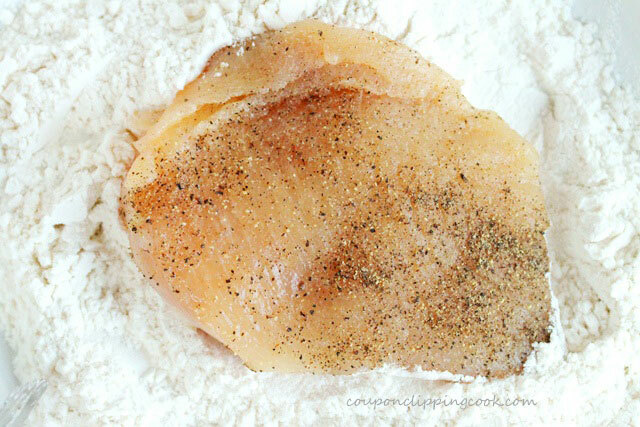 Dredge the chicken in flour and generously coat both sides. 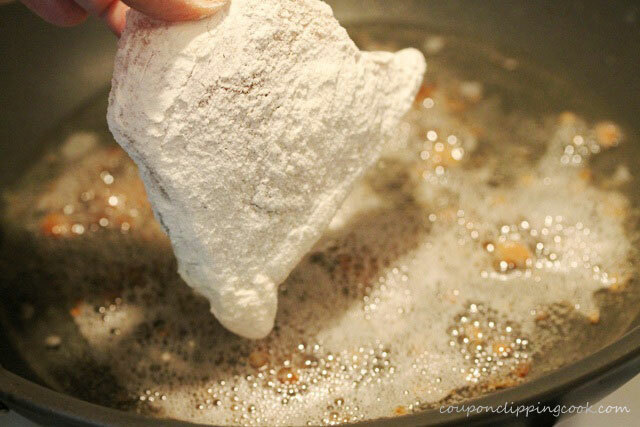 Set the floured pieces of chicken on a plate and set aside a moment. 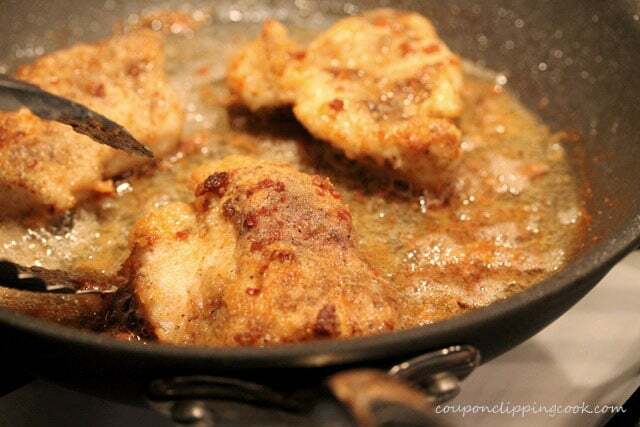 Frying the Chicken - Heat a medium size skillet on medium heat and add canola oil. To the skillet add real bacon bits and spread them around in the skillet. When the bacon starts to bubble and fry, carefully add the chicken to the skillet. 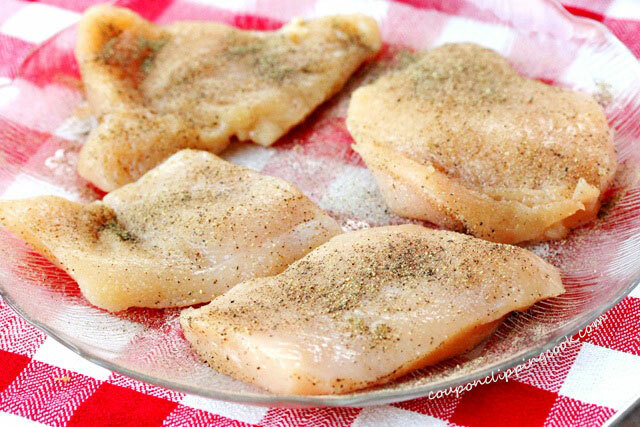 Depending on the size of skillet used, the chicken may need to be cooked in batches. When the bottom side of the chicken turns a light golden color, turn the chicken over. Then after the other side of the chicken turns a light golden color, turn the chicken to the other side again. After that side turns a little bit darker, turn the chicken again. The idea is keep turning the chicken so it doesn't cook or brown too fast. 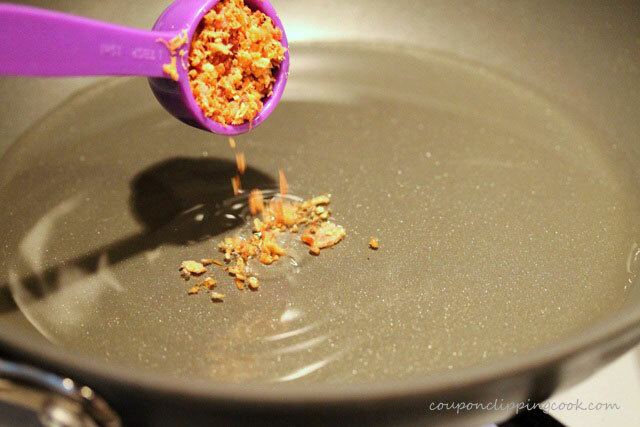 If the drippings in the pan are turning a darker brown color, turn the heat down a little. When all sides of the chicken are a light golden brown (about 7 minutes) and are thoroughly cooked turn off the heat and transfer the chicken from the pan onto a a rack or plate. 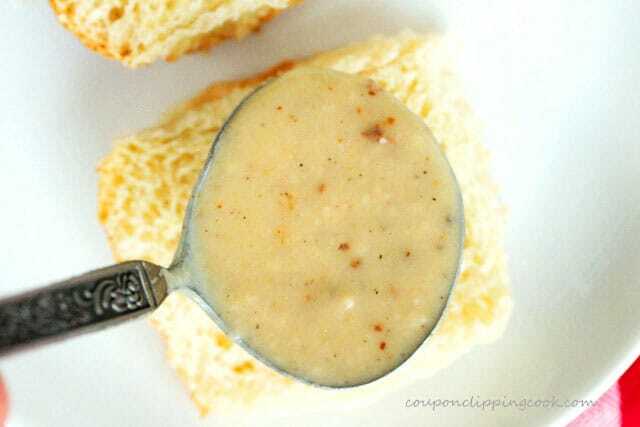 Set aside while making the gravy. 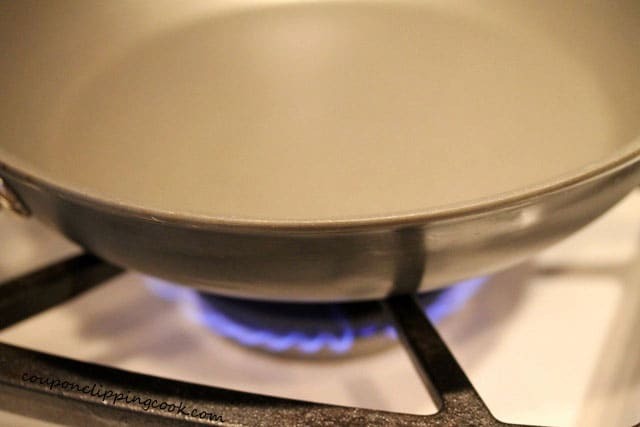 Heat the skillet with the drippings on low to medium heat. 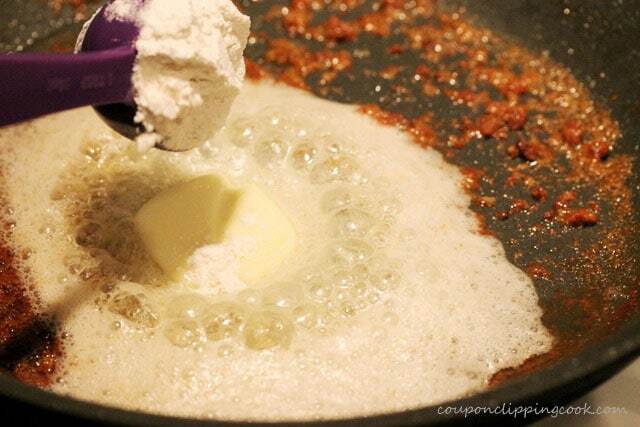 Add butter and flour. Stir until the mixture thickens (about 2 minutes). 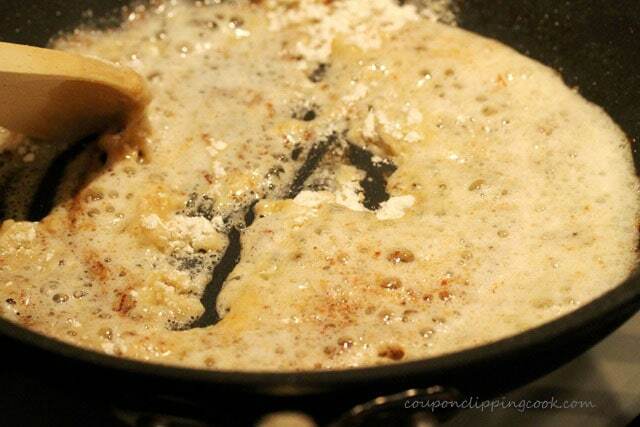 To the pan, add milk, water, salt, pepper, and stir. 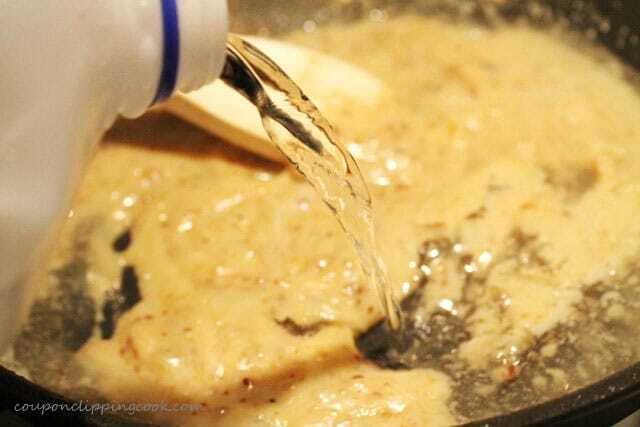 Continue stirring until the gravy is at the desired consistency (about 5 minutes). 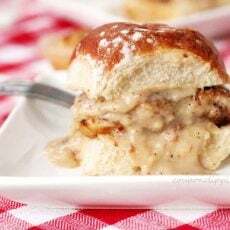 Lay the bottom side of each slider roll on the serving plates with the inside of the roll facing up and ladle gravy over it. 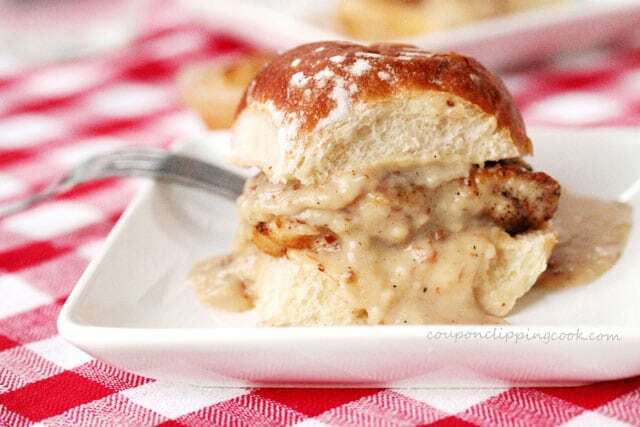 Top each one with a piece of fried chicken, and ladle more gravy over the fried chicken. Top with the remaining rolls. Serve while warm. Hi Vera, oh no, I hate when that happens. Hopefully the time will go by quickly. Thank you so much for stopping by and have a great day! This amazes me, like many others. It’s crumbed chicken and gravy, yet you have 35 pictures. Maybe some recipes worthy of a blog would be helpful, rather than space filling? Hi Gavin, thank you for letting me know your thoughts. I never looked at it this way but I just went back to this post again and I can totally see your point. I think I just get caught up in the pictures. I actually just cut out some of the pics and I like the post better. Thank you again for your feedback and have a nice weekend!